Europe’s largest port city of Rotterdam, situated in the south-western region of The Netherlands, is esteemed for its contemporary architecture and ingenious design. Home to nearly 1 million residents, Rotterdam’s history dates back to around 900 AD. Dotted with numerous museums, windmills, gardens and waterways, popular attractions include the Euromast, Grote of Sint-Laurenskerk and the characteristic Cube Houses. Cheap flights to Rotterdam are now available for a limited period of time, so prepare to be fascinated and intrigued by this unique city! Rotterdam is home to Rotterdam The Hague Airport (RTM), located on a 15-minute drive from the centre of town. With its medieval masterpieces, creative commercial buildings and innovative living spaces, it is little wonder that Rotterdam is a world capital when it comes to architecture. Some distinctive structures include the Maastoren skyscrapers, Hotel New York and Niewe Luxor Theatre. Explore this fascinating city on foot, by bicycle or by boat as you meander through the canals, lakes, coffee shops and museums. The city centre is graced with churches, war memorials, maritime relics and art galleries. A picturesque journey awaits on a day trip to the surrounding towns. Rotterdam is laden with museums, each one depicting different parts of its vast history. From art, to maritime, to natural history and war museums, you can easily spend days getting lost in the stories of this unique city. 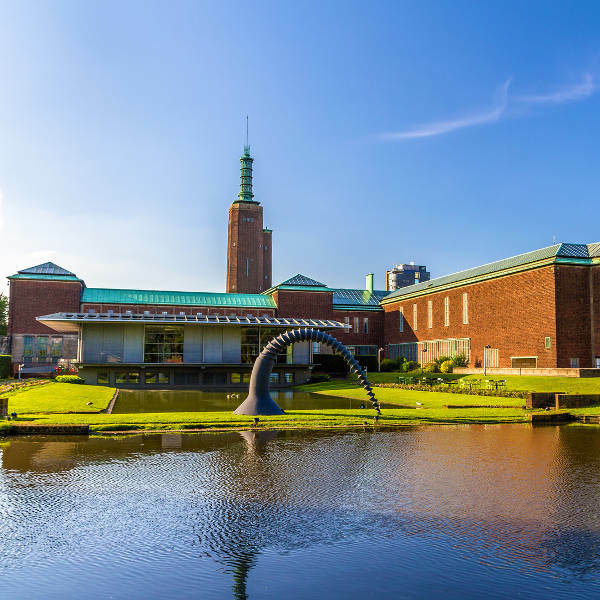 The Museum Boijmans Van Beuningen is not to be missed! Rotterdam’s peak tourist season is summertime, between June and September, when the waterfronts, piers, architecture and nature parks are best explored. The wind picks up a little during spring and autumn, while it rains consistently almost throughout the year. Beat the summer crowds and overpriced accommodation and visit this beautiful city during winter (November-March). The Rotterdam International Film Festival in January is a winter highlight, while the North Sea Jazz Festival in July is a summertime favourite! An inspiration of futuristic architecture, creative design, eclectic nightlife and diverse cultures– welcome to Rotterdam! The second-largest city in The Netherlands is a remarkable testament of triumph, creativity and perseverance over the destruction and bombing of WW2. 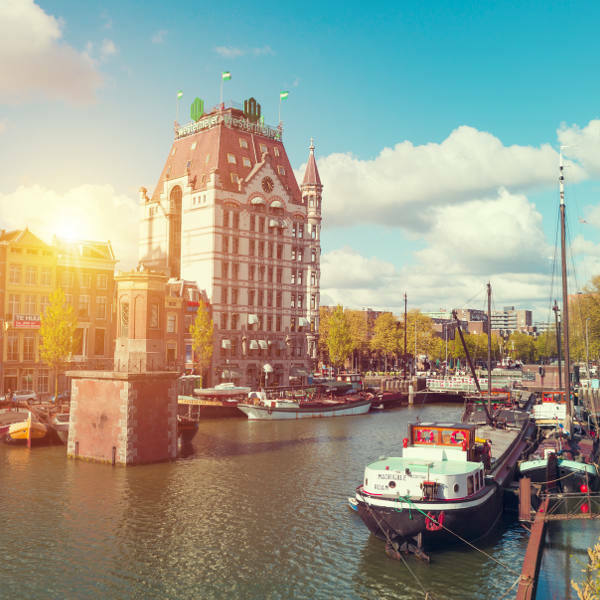 With its medieval churches, 2,000-year-old maritime history, contrasted with modern architecture, a lively arts scene and pulsating nightlife, Rotterdam is indeed a city where old meets new. Renowned for its architectural marvels, Grote of Sint-Laurenskerk (the only surviving 15th-century building) and the distinctive Cube Houses are not to be missed! The Art Nouveau-inspired White House is also worth a visit. Take a trip down memory lane aboard the historical Snerttram, giving visitors a guided tour of the city. There are also numerous boat tours exploring Europoort (known as the Gateway to Europe) and Rotterdam’s most famous landmarks, including Erasmus Bridge. 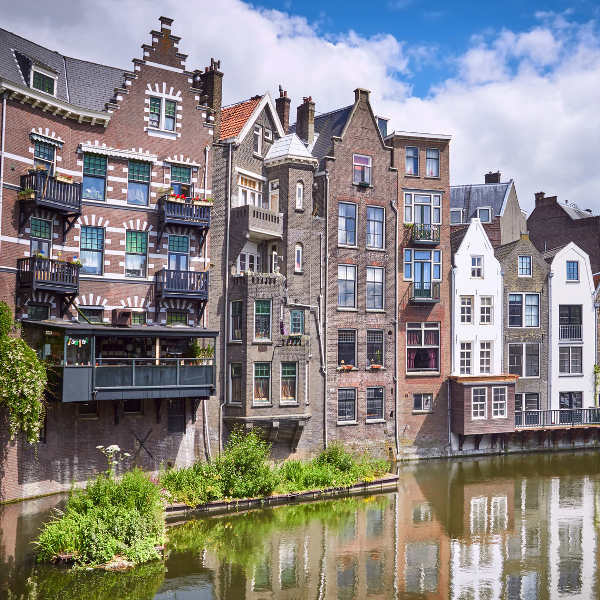 History enthusiasts should stroll through the Blaak district, reconstructed with fascinating buildings, while Delfshaven is a 17th-century neighbourhood dotted with canals, museums and pubs. The city’s four major lakes offer sailing, yachting and rowing. For spectacular views over the city, enjoy a night’s stay or dinner atop the Euromast or, if you’re feeling super adventurous, you can abseil down the building! For a unique shopping experience, head to Lijnbaan and Hoogstraat where you can find some quirky souvenirs, while the Markthal is bursting with fresh produce and delicious Dutch-French inspired treats over the weekend. Those in search of a more ‘when in Holland’ experience should pop into notable coffeeshops, like Nemo or The Rookies, to try out the local coffee and cannabis varietals. For a scenic day out, the picturesque village of Kinderdijk is home to 19 windmills where visitors can wander inside these 18th-century structures. A 30-minute drive from Rotterdam’s centre lies the sprawling fine-sand beach of Scheveningen, where bars, restaurants and water sports make for the ultimate beach party. Compare several airlines, and book your cheap flights to Rotterdam online at Travelstart! Rotterdam is a fairly safe city with a recent drop in crime rates. Petty crime like pickpocketing does occur, so be vigilant with personal belongings and try to store cash in several places in case you do get robbed. Metros are a popular place for pickpockets to lurk, so be on the lookout for any suspicious-looking people and, if approached by someone claiming to be a police officer, always confirm their identity before giving away information. Walking around is perfectly safe to do, by day and night as there is plenty of security around. Try and avoid dark alleyways and quiet parks at night.